"#1 Reason You Didn’t Get Hosting Right - You Didn't Use Netrepid"
These guys are fantastic. They put the right people in the room and work towards a solution that they stand behind. They don't get caught up in the hierarchy of it all, just normal folks like us trying to do right by their customers and deliver industry standard, secure, high performing services that just work. I haven't found anything yet, which sounds fake but it isn't. I am normally the first one to find and point out issues with vendors and partners. Nothing of note has come up. If you need cloud space or virtual servers, or just as simple as rack space in another datacenter you really need to give these guys a call. Hosting virtual machines and client environments in their hosting space. We liked them so much for our internal systems and servers that we have started moving our clients from other hosting space to them. Thank you for the feedback! We are excited to have you as a client. We are currently in the onboarding process with Netrepid, and so farthings have been moving along smoothly. They were able to quickly assist in transitioning from our old provider to them. Nothing specific to note. We are early on in the process of our Netrepid onboarding. Talk in depth with Sam. He is very good at explaining Netrepid's services and what value they hope to bring to the company. Looking for a hosted IT solution and a migration of our currently server environment to Netrepid's cloud. This is to reduce our capital expense budget on IT, and increase the uptime of services / ease of administration. Thank you Brian! I am glad things are going well. "Netrepid review by Automated Business Solutions - a transportation software provider"
We use Netrepid for hosting our servers and virtual services to our transportation customers. Our PtMS Mobile application is mission critical to our over 50 customers that use this service to transport over 25000 disabled and elderly clients each day. Netrepid's support response time is excellent at all hours of the day and night. The senior team takes a personal interest in communicating with us and maintaining oversight to insure any problems are resolved quickly. We also use Netrepid to handle customers request for hosting and infrastructure services. Sam Coyl's presentation material for these services is professionally done with fair pricing. It always delivered in a timely manner. We have no dislikes or complaints. The service has been first rate. Hosting are mobile data web service with their virtual server system completed eliminated our maintenance and up time issues. Thank you Steve! We are always here for you! The benefits of a hosting service that is secure. The billing system--which only recently reflected more accurate billing based on contract. While I know parts of this were due to fast growth on Netrepid's side, the resulting miscommunication took quite a bit of time that PANO could have dedicated to other work. We experienced opportunity costs.. Ensure clarity for all parties in the contract. Ensure that billing is accurate. One of the biggest benefits of Netrepid's service has been their attention to security. In my early days of working at PANO, we had a number of cyber security lapses which shut down parts of our operations for hours/days. These are not issues we have had to deal with in recent memory. I applaud the work that Sam puts into making this strong. "Netrepid has been a valuable partner over the past 6 months of our business relationship. " They have provided suggestions and solutions to IT issues that other IT companies had been unable to solve. They promptly respond to items of critical importance but also keep the daily projects moving. They provide excellent customer service. No items to note specifically. Switching from one company to another always has some bumps but these have been readily addressed and easily overcome. Netrepid is in the process of reconfiguring our teller capture machines to increase processing efficiency. Several other companies had attempted to do this to no avail. We expect to see a decrease in the wait time for customers when processing deposit transactions with a large amount of checks. "Excellent evaluation, preparation, knowledge, and execution"
Netrepid's professionalism, attention to detail and precise execution makes the company one of the leaders in the technology industry. I have no dislikes or complaints regarding Netrepid's work. Feel free to compare Netrepid to others in the field. Netrepid's knowledge and attention to detail cannot be beat. They are also very competitively priced. Netrepid evaluated a previous point to point wireless solution and recommended a much better solution that has surpassed my expectations. Netrepid has also advised us on networking and virtualization solutions. The Netrepid Greatness is felt immediately. Their commitment to excellence and strong processes is experienced on day one, and every day after. There is nothing about Netrepid I dislike. I would be nice to get to know the team better. Exchanging an unreliable hosting provider with a solid foundation and hosting excellence. The professionalism and knowledge of their team. They work really hard to resolve issues and to come up with solutions to problems. VPS servers do not come with complete root admin control. VPS - taking loads off of our data center and support staff. "Very interested in fixing issues and getting us back up on line." Patience, and thoughtful questions and resolutions to make the system work. Setting up new email addresses - not like the simpler setup with MSN or Google. I've made mistakes when inputting the incorrect SMTP address or port number. I'm hoping that this can be automated so my errant fingers don't do the input. They respond quickly and followup to insure things are still ok.
No problems - but I use their email service and associated storage of my company emails. The Netrepid team continually goes above and beyond to find a solution to our challenges even when it isn't their issue. Would like remote access to server management (vcenter or VCD, which isn't available currently). This team is truly top notch. We are not just a partner, we are also a client of theirs. Replacing an unreliable hosting provider and finding a true partner that has as much passion for its clients as we do. Quick response and professional response to problems. Very good at following up. Lack of notifications from them when they are working on the system, lack of notifications when updates occur. Techs and admin should notify users when working on the system especially if it requires down time. Notification should provide time estimates system is being worked on. Handle our IT, they are our IT department as well oversight of our accounting system and its apps. Netrepid is very quick at responding to any issues I may have with my laptop and system. I start work very early in the morning and Netrepid starts at 8am. I will have to wait until they are open in order to get my issue fixed and be able to work. Very quick and good at fixing issues. Workers are polite, friendly, and timely. It is nice to have Netrepid onsite as well as remotely. All the staff I have worked with are friendly and patient with someone that are not real good on a computer. They usually answer your emails in a timely matter and also fix the problem timely. Sometimes I wish they were in the building more. They are very helpful. I have employees in my department including myself that did not have computers in the classroom. They are always willing to show us how something gets done when we do not know. Thankfully, they can also fix problems from a remote location that becomes VERY helpful. I am confident about the Netrepid technicians. Customer service that is reliable. I could call around the clock and someone could help me. Servers didnt' update fast enough. The problem for me was that the servers did not update instantaneously and in the news industry you need that. It would take several hours for changes to take effect. Netrepid is a great company. Veteran owned, great customer service. Wouldn't really say I was solving a problem. Netrepid served as a host for a website I was building. The problem for me was that the servers did not update instantaneously and in the news industry you need that. It would take several hours for changes to take effect. I have been impressed with the quick turnaround on any issue we encounter, the professionalism of the techs that we speak with over the phone and who come out to work on site. We have dealt with some difficult issues, and the individuals we have worked with have been patient, thorough and, ultimately, successful. I have honestly not found something to dislike. Reworking our network, cleaning up computers, developing a wireless network. Netrepid is an outstanding company who understands their clients needs, large or small. They have a great amount of flexibility and were incredibly timely with my needs, I highly recommend them from a technical standpoint, customer service and commitment to their clients. There is nothing I can comment on here, everything was great. email, web hosting, domain management. They gave me an easy way to present and manage my business. At this time I have no dislikes for Netrepid. When I have a system / program problem they are quick to resolve the challenge. This keeps me timely with entering billing for my company - and keep the company timely in submitting claims to insurance companies. "Netrepid is a class act"
The team at Netrepid is dedicated, professional, and highly driven to complete customer service. They make you feel as your needs - large or small - are the most important they have to address. I dislike that I have not come to know of the Netrepid team sooner. A responsive, reliable hosting partner that views my clients needs the same as their own. We switched to Netrepid for our Exchange mail and have been very happy. Their team did all the set up for the email change over and have been very helpful with issues we had with some of our software integration. Nothing so far we have been very happy . Email issue are a thing of the past. "Netrepid is a great help for a small non-profit!" Netrepid is very responsive to our IT needs. They have helped us build our IT infrastructure from the ground up, and continue to help us grow. Sometimes it is difficult to reach them by phone. We came form an environment where all machines were computing individually and now we are all connected even between two offices. "Have just signed on with Netrepid but so far they have done everything well and have delivered." Knowledgeable, excellent service, timeliness of service. We have not experienced any issues with our service at this point. They were fairly easy to contract with and implement. Get a clear understanding of the services up front and everything will go smooth. We are building an insurance agency and they have provided our IT architecture and support. Thank you Michael. We are excited to see your agency take off!! "Netrepid has been very professional, patient and responsive"
Netrepid has continued to support me on a project for my client that has changed scope and timelines regularly. Netrepid has continued to accommodate the ever changing needs. The original engineer that worked on this project is no longer available, however the new engineer has been working out very well. Support on a Citrix environment. Sam was quick to assist and understood my needs/requirements, and helped guide me to co-location service. Nothing to dislike. The process for setting up was simple and fast. I was looking for a co-location facility that wasn't halfway across the country or cost a fortune. I needed 6U of space and be accessible for repairs/upgrades. Quick response & quality results. Their environment is compliant in security protocols. They proactively ensure aging hardware is replaced before any issues can occur. N/A - there is nothing I dislike about Netrepid. Netrepid has provided a solid hosting solution with amazing support and knowledgeable engineers. Staff do work to resolve issues, most times staying on line and explaining what they are attempting. The problems that boggle the staff. They will sign off and many times we are the ones to follow up with them. We do not need to have an IT staff in house. "Netrepid is a professional, reliable company that takes care of your needs." Netrepid easily understood what I wanted/needed and customized the job for me, even though all I needed was a small website. I can say as of yet there is nothing I dislike. All of my expectations have been met. They helped me with my businesses exposure on the web. "Developed a new website for startup company." The knowledge of the people with whom I worked with was tremendous. Very easy to work with and quick on solving problems. I did not have any issues that came up in building this website. Developed a website for my new company. Next phase will be with IaaS. The on-site staff member to help with daily issues and then the back-up support of the remote staff. I don't have any dislikes based on how I use the service. Internet and shared drives needed to conduct daily benefits. Like that Netrepid is proactive in maintaining the system. "Netrepid has helped us transform our business through technology." There staff is easy to work with. I base many of my business decisions on relationships. I feel comfortable working with Netrepid. Sometimes projects or receiving information drags on too long. We solved state wide network and hosting issue I had. It was really a great project. "Has been good overall at keeping spam out of my emails and keeping my computer safe." The monitoring of my emails seems to be good. I have spam emails blocked from my inbox. That some emails which are not spam are monitored and sometimes i do not receive them. I like the techs, especially Kyle. It seems to be fairly easy to get a hold of you. Only service interruption but I don't think that can be helped. It usually is an internet issue. Thank you for your comments. We love having Kyle on our team. I like that we have a person who is dedicated to us and I can contact him with needs. The seamless transition and the complete security and privacy of patient information. Back Up - Off site back up is amazing. We use Netrepid for collocation of our server environment. We have a unique setup in comparison to their normal customers and the Netrepid team has met and exceeded all of our needs. We have been a customer for almost a year and so far we have not found anything we dislike a out Netrepid. Netrepid gives us a solid foundation to host our servers and several different environments for our customers. The ease of use in submitting help tickets and the rather quick turn around time. Overall, I can't really think of anything I don't like. Assistance with server, computer issues, maintenance requests. "Support customized to our needs"
Netrepid provides fully customizable resources to meet our individual needs. They helped us greatly to improve all aspects of our network, servers, websites, hardware, software, security and backups. Nothing. We have access to the full team at Netrepid from the IT tech at our location to the CEO and everyone in between. Unparalleled back-up and restoration service. Connecting multiple locations. Increasing network speed and security. Offering public wireless. Great place to host your client's infrastructure or extend your own cloud. Netrepid has all the latest technology and security features built into their data center offerings along with a very competitive price. They have been in the middle of a data center expansion for the past year and that has caused some hiccups, but nothing that couldn't be resolved easily. Hosting clients' DR infrastructure, cloud-based backup solutions. Working with a local company who took the time to get to know us and our business. Can be difficult to reach by phone, they seem to prefer using the email ticket system. We use simple email and website hosting; don’t take advantage of some of the more complex services. But good to know we can add services when we are ready. When I leave a message regarding an issue I usually receive a call back within 30 minutes. Some staff are more knowledgeable than others, which is understandable, but on a few occasions I have directly asked for Kyle as he is always able to solve our problems. When our internet is down, we can't check patients in, take copays, schedule, etc. Netrepid has decreased our downtime. Great customer support and service. Service team is very responsive to our needs. Nothing. Working with Netrepid has been a seamless transition. Netrepid serves as out hosting company for our business providing a solid platform for our IT needs. For a small company they provide us with a rich portfolio of applications, security, disaster recovery, and backup needs along with a qualified team of technical resources. 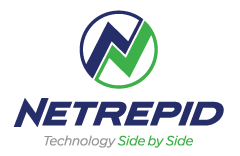 "Netrepid was able to provide a solution for our IT needs"
Netrepid's response time and courteous, professional, knowledgeable staff. Meet and talk with Sam and/or the staff. They are extremely helpful and would be more than happy to design a solution for your needs. Netrepid is providing web and database hosting for us. We have experienced reliable up-time and outstanding service. Personable staff & quick response. Easy to reach. As a web designer/developer, the sheer speed of the service blew me away the first time I used Netrepid. Occasional down time. Once or so, every 2 months, we may see a website down. Usually not for very long. Hosting websites with them. Their server speed is unmatched, and the customer service it terrific. Hands on support is great, we've had several situations where we've used Netrepid's techs. Location is very convenient for us. Security could be more sophisticated, higher level of security overall. No need to build out internal infrastructure. Custom setup without having to setup redundant power, cooling, fire suppression, etc. Netrepid has always been very responsive and never makes you feel dumb. Great customer service. Has always been friendly. I am not sure what I dislike. I have not had any experiences that did not go well. Netrepid has taken over our entire IT function. Customer service has always been excellent. Sometimes I'm not as tech savvy as I wish I was and that can create a miscommunication. We are using Netrepid for storage and email. It has been a cost saver and time saver for us. THEY ARE VERY HELPFUL AND QUICK TO RESPOND. I RECENTLY HAD AN EMAIL THAT I WAS NOT SURE WAS LEGIT OR NOT AND THEY RESPONDED IN LESS THAN 10 MINS. * We monitor all Netrepid reviews to prevent fraudulent reviews and keep review quality high. We do not post reviews by company employees or direct competitors. Validated reviews require the user to submit a screenshot of the product containing their user ID, in order to verify a user is an actual user of the product. Hi there! Are you looking to implement a solution like Netrepid?